Ashton Kutcher is one of the most successful people in new Hollywood. The former That 70’s Show actor has become a media mogul with television and film projects. His executive producing credits are all over cable television. On film he has mostly done silly romantic comedies such as No Strings Attached, Valentine’s Day and What Happens in Vegas. Those types of films make tons of cash but get little respect in Hollywood critic circles. His first step into truly adult roles is Jobs. The story is of the rise and fall and resurrection of the founder of Apple computers, Steve Jobs. The film starts at the end with the introduction of the man in a series of long shots, describing his latest invention. We get used to the voice and the mannerisms before we see a close-up of the actor playing the icon. Then the film goes back decades. Steve Jobs is a college student who has dropped out but still attends classes. He has a massive thirst for knowledge but little direction. He’s more interested in seducing co-eds than building computers. In his youth, he takes acid and visits India. He lives in his barefoot existence of the post-hippie college world. His professors know that Steve is brilliant; he just has not found his purpose. He works for Atari and is frustrated by those who say no and it cannot be done. Jobs is friends with Steve Wozniak (Josh Gad). Wozniak has combined a computer board with a television. Now, one can see what they are doing in programming and running the machines. This opens the eyes of Steve Jobs to the idea of a personal computer, something no one else has ever considered. At that time, computers were these giant beasts that took up rooms. The two start Apple Computers in the garage of Steve’s parents’ house. Eventually, others begin to understand the vision of the two Steve’s. Mike Markkula (Dermot Mulroney) becomes the money behind the venture. In the world of Jobs, Steve Jobs isn’t so much an inventor but a salesman of a dream. He surrounds himself with the best innovators and feeds off of them. The story of the movie follows the rise of Apple Computers and what happens when the company goes public. Eventually there is a board of directors who want a guarantee on their investment. This goes in direct opposition to the founders. They just want to make cool stuff, damn the cost. The conflict between commerce and creativity drives the plot of Jobs. The story of Steve Jobs is an American story. It is of the dreamer in all of us, the guy who believes with such a passion that he makes mountains move. The film tries to encompass an entire life in two hours but it feels like director Joshua Michael Stern rushes through things. There is not even mention of Pixar and the iPhone, easily two of the greatest achievements of Apple. 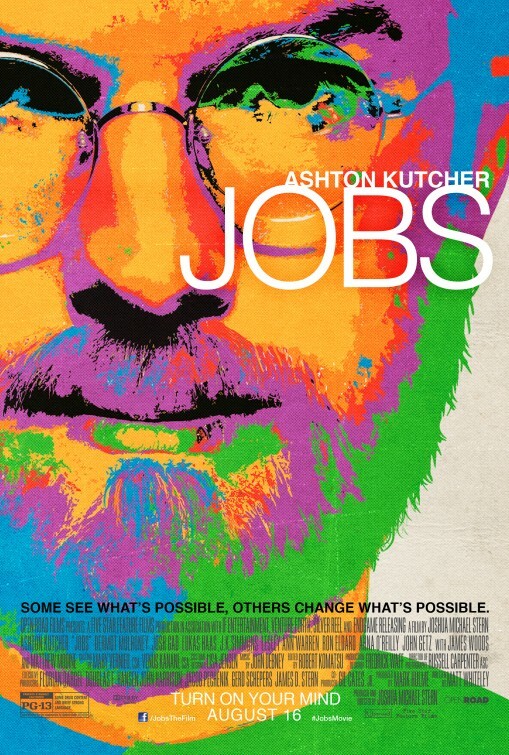 The biggest reason to see Jobs is to see the development of Ashton Kutcher into a character leading man. He gets all the mannerisms right but never the internal man. We still do not know why Jobs was the man that he was, no great revelation to why he did what he did. It is much more of an unsolved mystery than the answer to a question. Josh Gad is a standout as Steve Wozniak. He is the true brains behind the personal computer, an unsung genius in the shadow of Steve Jobs. This comic actor proves that he can handle more dramatic roles with grace. We feel more for him that for Jobs during the running of the movie. Jobs is a good movie but not a great movie. It is a longshot for Mr. Kutcher to get an Oscar nod. It is much more of a film about belief than about computers, more about the thinker than the hardware.